How does this happen every year? One minute I’m looking at the calendar and it’s the beginning of December, and the next minute Christmas is barely a day away. Actually here in Germany it’s Christmas already, since the main part of the celebrating is done the night of the 24th. While that’s a little hard to get used to for someone raised on the Christmas-morning adrenaline rush (and really, what’s Christmas without the too-excited-to-sleep night before Christmas? ), I’ve decided that the best thing is to embrace both traditions, which is exactly what we’ll be doing. After all, that means twice the Christmas fun! But Christmas Eve is far from the start of holiday celebrating in Germany. 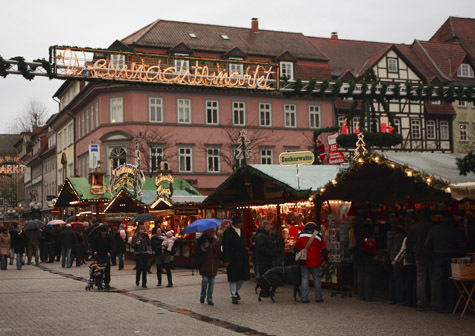 In fact, it’s been going on for nearly four weeks already, in the form of the Weihnachtsmarkt. Otherwise known as the Christmas market, most medium-to-large cities stage one each December, usually in the heart of the old town. 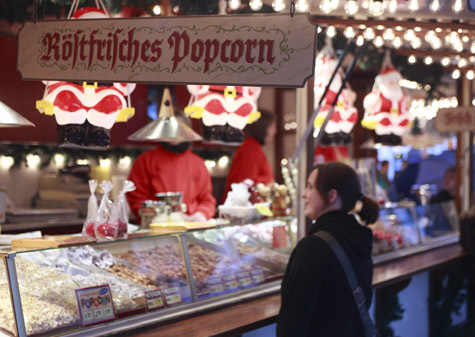 While the most famous ones may see more tourists than locals, most Germans wouldn’t dream of missing out on their yearly pilgrammage to the market to eat, drink and shop and catch up with friends. In other words, it’s still a very important part of local holiday tradition. I’m short on time as we rush out the door to my inlaws’, but before I go I wanted to share a few images of this year’s Weihnachtsmarkt in Göttingen – in particular, all the things to eat and drink! 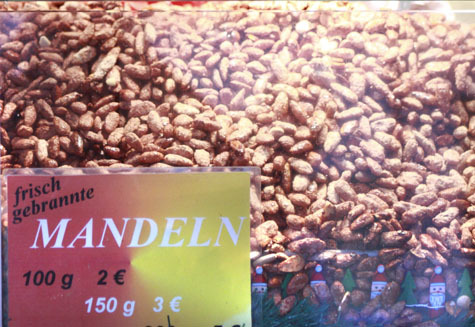 …to one of my favorite things ever, gebrannte Mandeln (literally, burnt almonds). They’re almonds that have been roasted in a mixture of sugar, butter and cinnamon. Fresh from the roaster, they’re simply heavenly. But they’re good cold too – I always buy an extra packet and stash it away until after Christmas. 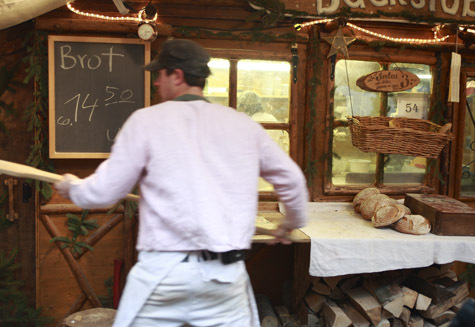 Flammkuchen, a specialty of southwest Germany and Alsace, has also gained tremendous popularity here in recent years. 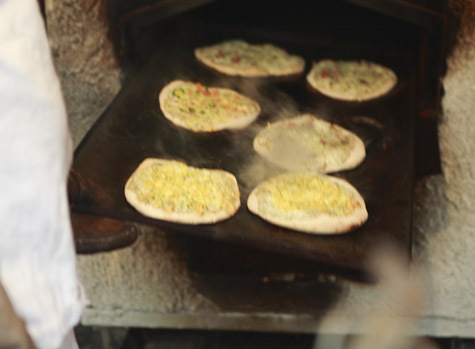 This stand bakes them to order in a huge wood-fired oven, little rounds of bread dough smeared with sour cream and a variety of toppings. The classic is thinly-sliced onions and bacon, but this one has chunks of soft potato and cheese. Not that it wasn’t good, but I think I’ll stick with the classic next time. 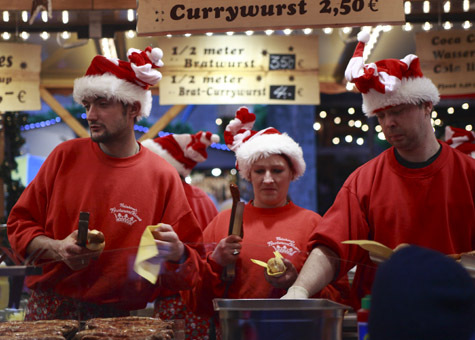 The most popular Weihnachtsmarkt snack isn’t Flammkuchen, though, it’s Bratwurst, the famous German sausage. You can get one plain or as a Currywurst – sliced up and topped with ketchup and curry powder. Yes, it’s an acquired taste. I’m still in the process of acquiring it. Holy cow, do you see the size of those sausages? 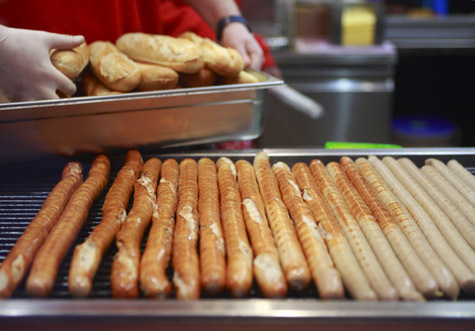 They’re the famous 1/2-meter bratwursts – that’s one and a half feet long! One of those is enough to fuel some heavy-duty Christmas shopping. They come in normal sizes too, though, and are best enjoyed dripping with ketchup and mustard like hot dogs back home. 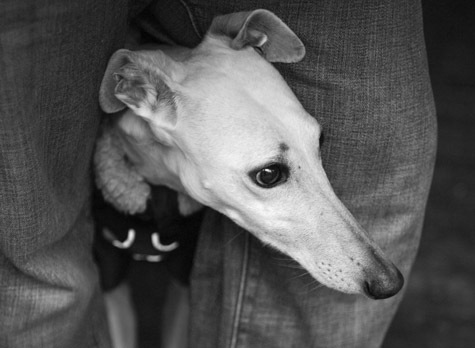 Speaking of hot dogs, that’s something Lily most certainly wasn’t, even in her fetching winter coat. Luckily she discovered a convenient spot out of the rain. And what to drink with all this food? Well, here there is really only one option. I mean there are other options, but you’d be crazy to even consider them. 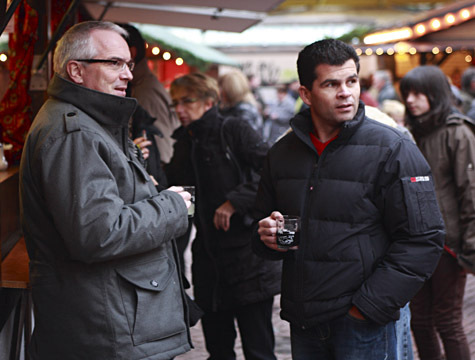 Everyone who comes to the market has to warm up with at least one glass of Glühwein, otherwise known as hot mulled wine. It’s so popular I think it replaces the blood in Germans’ veins each December. Everyone, young and old, drinks it (although for the really young there’s a nonalcoholic version), and the stands that sell it act as community meeting places. Everyone seems to run into half the people they know while drinking a Glühwein. And I must say, it warms your fingers better than any gloves. Actually it warms you from head to toe, not to mention makes that last-minute shopping infinitely more bearable! Merry Christmas everyone! May your holiday tables be overflowing with good food and even better company. p.s. Menu for Hope ends tomorrow! If you haven’t donated yet, you still have time… but hurry!! Glühwein is Christmas in Germany. Hot, spiced and boozy, it’s just the thing to thaw out frozen extremities and put a healthy glow back in your cheeks. I find it plenty strong with wine only, but many prefer it with a little extra shot of something. And while it may be lacking somewhat in atmosphere, the homemade stuff beats the pants off what you get at the Weihnachtsmarkt. In a large, heavy-bottomed pot combine all the ingredients (except the optional booze) and place over low heat. Cover tightly and bring to a gentle simmer (don’t let it boil, or the alcohol will evaporate! ), stirring once or twice. Remove from the heat and let steep for 30 minutes. Just before serving, return to low heat for a few minutes. Strain out the aromatics and serve hot. 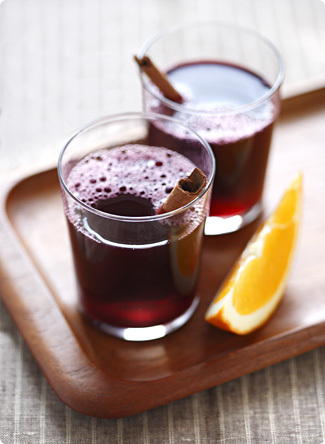 For an extra kick, add a splash of rum, brandy or kirsch to each glass. I remember having a Glühwein many years ago and I must say I slept like a baby after about 2 of those! ha! so festive, we also have a Christmas Market in tinier form here in Osaka. Happy Holidays! 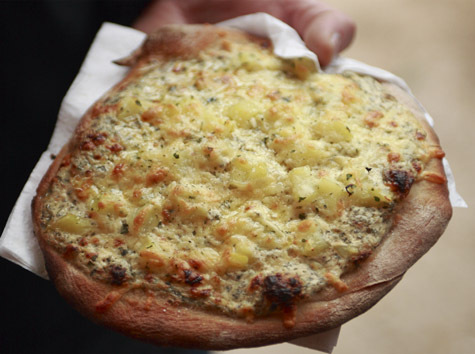 I’m part Alsatian, and of all the German/Alsatian foods, I have a particular soft spot for flammeküchen, or tarte flambée as it’s called in Alsace. It’s been in regular rotation on my dinner table lately. Those sausages don’t look bad either, though! Happy holidays to you and your loved ones! Thanks for sharing with us what this festive season means in Germany! I enjoyed looking at the photos; I was salivating at the thought of the caramelized almonds and the little breads oozing with cheese. I am going to try this hot spicy wine it looks perfect for a cold winter night! (just have to wait to get back to Texas here in Beirut the weather has been perfectly mild I am afraid)Happy New Year! Thanks for this wonderful post! Everything you mentioned brings back all of my wonderful memories of living in Germany. December is my favorite month to be in Germany. 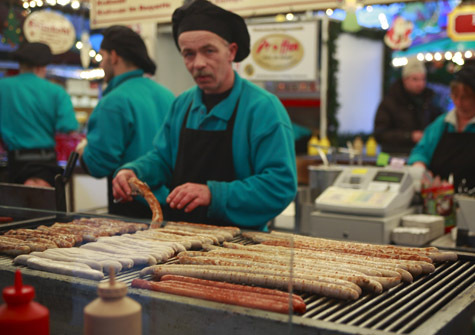 I spent many an evening drinking Gluehwein and eating Bratwurst at the Weihnachtsmarkt. I remember seeing "American Donuts" everywhere but not popcorn…definitely must be a new addition. Did you try the popcorn? Is it sweet, like what you get at the movies? Happy Holidays! It has been a couple of months since I started following your blog and I really loved it! It inspired me in a whole lot of ways. 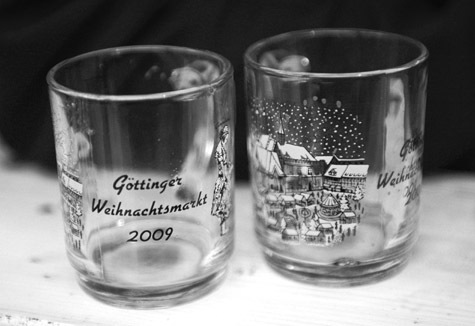 I remember tasting at my first Glühwein at a Christmas market in Frankfurt. I was freezing cold but the wine warmed me up in a hurry! I invested in an angel for the top of my Christmas tree that evening and we still use it today. 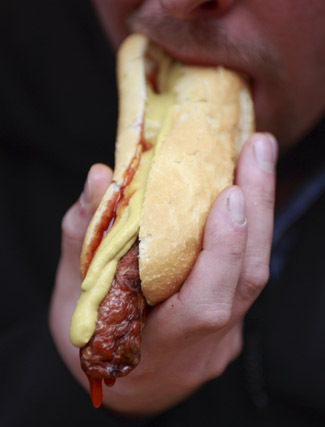 I’m sitting at my desk on a freezing friday morning and that picture of a hotdog makes me want to run out by one straight away it looks delicious. Flammkuchen and mulled wine. Can’t get better than that. Me again! I brought back some goodies from Lebanon and I am giving them away, in case you’re interested! I love gluhwein, or it’s Scandinavian cousin glogg. I’ve even made a version from port and brandy that’s got enough kick to make it best enjoyed in an easy chair in front of the fireplace AFTER you get home from shopping. It’s a warm winters nap in a cup. Thanks for the post – love the pictures. I lovelovelove currywurst! There was a German guy in Brighton who had a sausage food cart; he calls himself Herman ze German and his currywurst was awesome. :)I love mulled wine. The first time I made it I realized that it’s basically hot sangria with spices. :)Hope you’re settling in well (back) across the pond! yum….I’m so hungry now after reading your post!